Ms. Celiac Says...: It's a Wrap! I was lucky enough to receive samples of all 3 flavors and they are absolutely perfect for making sandwich wraps! The tortillas are best stored frozen and then heated up in the microwave for about 25 seconds prior to eating. Even better, these tortillas contain 5 grams of fiber per serving and are made with whole grain flours including sorghum, brown rice, corn, amaranth, quinoa, millet and teff. For more information, please check out their website at www.rudisglutenfree.com. 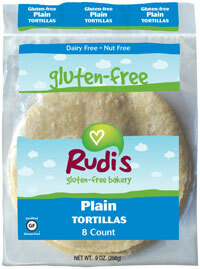 Rudi's Gluten Free Bakery products are available at Whole Foods and other health and natural food stores.